I had one of those moments the other day. I don’t like to talk about it too much because it’s kind of embarrassing, even though it happens to all of us. Luckily the moments are rare and mostly fleeting – I decided to make a virtuous dessert. I don’t know what possessed me. I’d like to say that it was a one-time thing, and that it will never happen again. Unfortunately, I know that’s a lie. I’ve learned that the best way to deal with these lapses in character is to embrace the moment and move on as quickly as possible. The infraction in question occurred when I volunteered to make dinner for a friend at her house. I was trying to be nice because she just got off the plane after a long trip, and there was no chance for her to do any grocery shopping (not to mention the jetlag from jumping 6 time zones). I didn’t want to make anything heavy (I knew she wanted to get to sleep about 14 seconds after we walked out of the door), so I grilled salmon with blueberry dijon sauce that I wrote about earlier. For dessert, I didn’t figure there was anything simpler than a fruit salad. But fruit salad is so boring. I wanted to put a small twist on it, so I decided to grill some of the fruit I had on-hand to play with. In the fridge I had a few kiwis that had been sitting around too long. They were too far gone to eat raw, so I thought, ‘What the heck?’ I put them through the food processor and basically made a kiwi simple syrup out of it. If nothing else, the green flesh and black seeds would add some interesting contrast to the pineapple, peaches, and blueberries I had in my arsenal. Of course, grilling the fruit brings all of those sugars to the surface (OK, I didn’t grill the blueberries – I couldn’t find a way to keep them from falling through the grate). The hint of smoke from grilling contrasts with the natural sweetness of the fruit, making a more complex taste. But, I’ll tell you what, the kiwi sauce brought the whole thing together. That little extra sweetness from the simple syrup pushed it over the top. I imagine I’ll make Grilled Fruit Salad with Kiwi Sauce again in the future. So this is one moment that might not have been all that embarrassing after all. In fact, it turned out pretty good – I just don’t want to repeat it too often. Virtuous dessert – how often does that happen?! Place chopped kiwi in food processor and pulse until smooth. Transfer kiwi to small saucepan over medium heat. Add sugar and pinch of salt. Place pineapple and peach slices on grill and sear 2-3 minutes per side, until fruit is soft and sugar begins to caramelize. Place a slice of pineapple in the center of dessert plate. Fill center with ¼ C fresh blueberries. Arrange 6 peach slices on each plate. 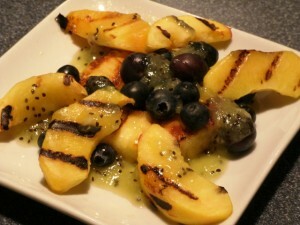 This entry was posted in Cooking and tagged blueberries, dessert, fruit, kiwi, peaches, pineapple. Bookmark the permalink.